HH Mini Fall ~ Make a splash when you own the HH Mini Fall. It's funny because this hairpiece is anything but mini. Over 18 inches of shoulder length hair that has a large wave at the bottom of it. You can really change your look from the ordinary when you're wearing something like this. Instead of trying to get your own hair to look just right, you can save yourself the time and own the HH Mini Fall. Constructed from the highest quality materials, it's no surprise then that the fibers themselves are crafted from 100% human hair. 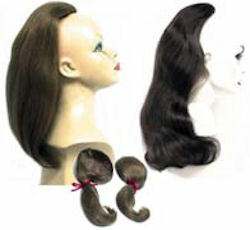 Here at Wigs US we only provide our customers with the best made hair at the lowest prices available. With all the colors we have currently available, you should be able to find the one that is just right for you. Matching your own hair color to the Mini Fall won't be a big problem like you think it may be. Special order your custom color, and we'll find it for you in no time. With our incredibly fast shipping, if you order the HH Mini Fall today you'll have it at your door step within just days. 5 inch x 6 inch base, large wave at bottom.